SHOULD owners of highrise apartments be taken to court for defaulting on their monthly maintenance and sinking fund charges? Living in a high-rise building has its advantages, such as better view and zero-noise pollution. Many innovative developers like Tropicana Corp Bhd, Mah Sing Group Bhd, UEM Sunrise Bhd, I-Berhad, SP Setia Bhd, Bandar Raya Development Bhd and Bukit Kiara Properties Sdn Bhd have become the choice for buyers when it comes to luxurious homes. Depending on the developers, there are many amenities to be enjoyed. For example, the Tropicana City Tropics serviced apartments in Petaling Jaya offer a gymnasium, 40m lap pool, beach pool, wading pool, tennis and squash courts, sauna, steam room, function room, laundromat, housekeeping facilities and concierge services. Another important element for high-rise developments is security. Most developers offer three-tier security that includes keycard protocols, closed-circuit television cameras and vehicle access card system, in addition to 24-hour physical security. Buyers don’t mind paying for such properties, which can range from RM400,000 to more than RM1.5 million each. 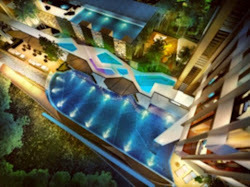 Even apartments within the affordable range of RM250,000 to RM400,000 offer facilities such as swimming pools, tennis courts and security. While owning an apartment with all the amenities can be a pleasure, some owners have refused to pay the maintenance and sinking fund charges. When there is not enough money in the pot, the management of the building will have a tough time maintaining the properties. In the long run, the apartment building will start to deteriorate. So, if home owners default on payments and the buildings and their surroundings are affected, the developers should not be blamed. Many may have forgotten the terms in the sales and purchase agreement and deed of mutual covenants (DMC) of a property in a high-rise residential block, where it is clearly stated that the monthly maintenance and sinking fund charges must be paid. The charges are for the joint management body (JMB) to provide services and maintain the property. The JMB is made up of the developer and/ or developer representative and purchasers. If owners do not pay, the JMB may not be able to even provide the basic services, such as maintaining the lifts or drainage system. Maintenance fees are collected for repair and maintenance of common areas, carpark, footpaths, roads, windows, gutters, drains, lifts, and electricity and lighting for common areas, landscape and gardening, pest control, security (internal locks and doors, intercoms, external doors and gates), safety (smoke alarms, fire extinguishers, health and safety inspections) and refuse collection and recycling services, as well as professional charges (building insurance public liability insurance, etc) and JMB’s legal/auditor fees. A sinking fund is basically money put aside yearly to cover the cost of major long-term expenses, such as lift or roof replacement or repair. It can be used for refurbishment and improvement of the building. Paying the maintenance and sinking fund charges is a collective obligation for the common good of all residents in any residential building. Despite that, some owners refuse to pay the monthly maintenance charges, knowing that shared services cannot be interrupted and there is a lengthy legal process to recover the monies due. It is a legal requirement for owners of a high-rise property to pay their dues under the Strata Management Act 2013. The law prescribes a specific recovery process in the event an owner is in default and fails to meet this requirement. An owner is deemed to be in default if the monthly maintenance and sinking fund charges are outstanding for more than 60 days. against you under the DMC. This may include posting the information of the defaulting property owners on the notice board, issuing reminders and warning letters to the parties concerned, imposing interest and/or collection charges on the arrears and taking legal action through the Small Claims Tribunal. The JMB can also claim outstandingdues from owners when they sell their properties. It can get a court order for money to be deducted from the sale proceeds. In the end, the owner will still have to pay his dues, plus fines and late payment charges. Malaysia needs a regulatory body to spearhead transformation in this area so that home owners who pay their monthly maintenance and sinking fund charges do not suffer and that developers are not blamed for maintenance or structural problems.